Hi everyone! I have something really cool to share with you! Lately I've been brainstorming and trying to figure out a way to take edible teacups to the next level. What popped in my head was an idea for an edible tea bag and unspillable tea! For the tea bag, I already knew which edible supply I would use, but what about the tea? I thought about coloring fondant a brown tea color, but that wouldn't have that realistic appearance. No, it had to be clear! But what could I use? I tried so many different ingredients in my cake cabinet, but nothing worked! Well, then it hit me! It was a recipe I had used before! My only fear with this recipe is that it may be too hot and would melt my teacup... but it didn't! It held up perfectly and looks like real tea! 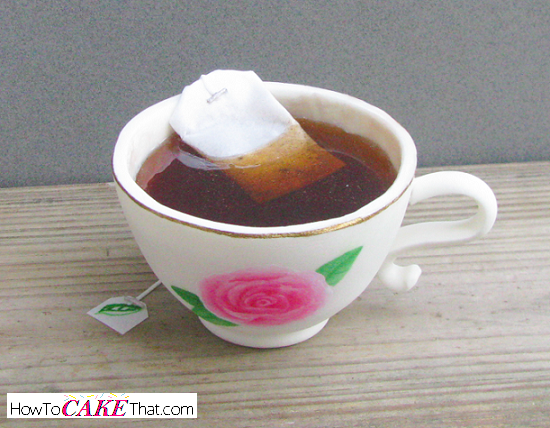 Just be sure your gum paste teacup is completely dry and is thick, not thin before you try this idea. To start, we will first make our tea bag. You will need edible paper known as wafer paper (or sometimes called rice paper). 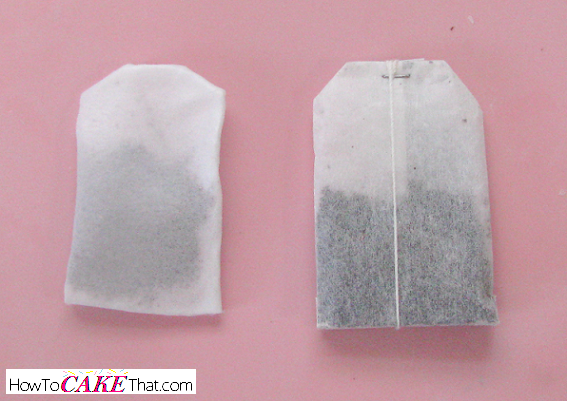 You will need to estimate how large you want your tea bag. I placed a real tea bag next to my wafer paper to help me eye up the shape and size. Cut one piece of wafer paper large enough to fold in half and also with enough to tuck in edges. In order to make our wafer paper pliable enough to fold, it must be lightly steamed. 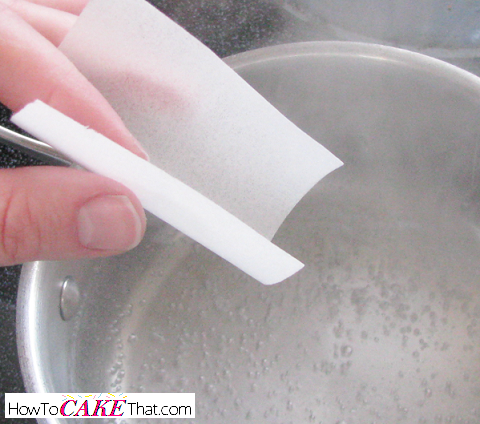 If you own a steamer, that would be the best way to steam your wafer paper. But if you do not own one, just boil some water in a pot on the stove. Be careful not to get burned. And be sure not to over-steam your paper or it will dissolve. Lightly pass the wafer paper through the steam, and gently bend the wafer paper until the end designated as the bottom of your tea bag is touching (see photo below). Your wafer paper should look like this. The bottom ends brought together, but the middle is separated and like a pocket to hold the "tea leaves". 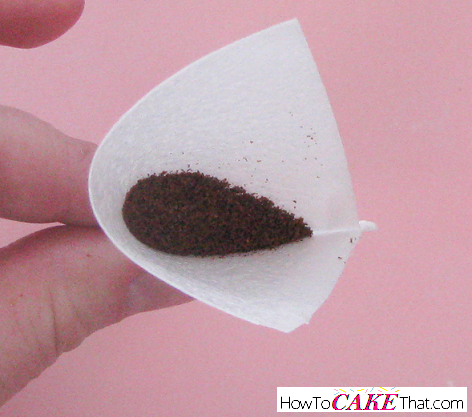 Next, make a tiny fold on the bottom of your tea bag and pinch together. This will help seal the bottom together. 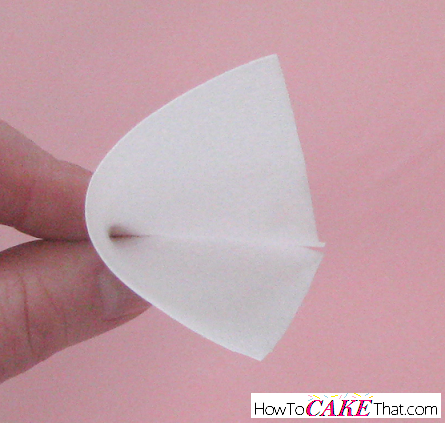 Pass the wafer paper through steam again if the paper is too stiff to make the fold. Now it's time to add the "tea leaves". I wanted something really dark, so I chose cloves. But you can use any edible dark powdery or granulated ingredient you'd like such as dark brown sugar or cinnamon! Next, run the edible tea bag through the steam again and bring together the side and top seams. Fold the side seam over to seal it just like the bottom seam. 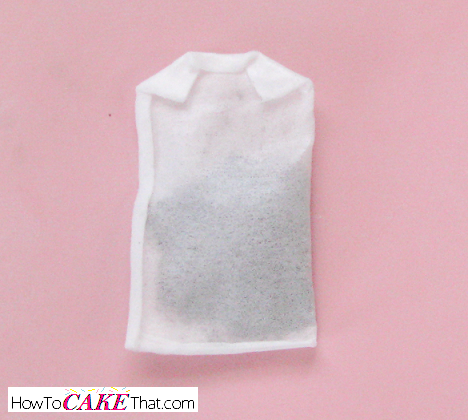 Fold the top seams in keeping in mind the shape of the real tea bag. How cool is that?! Looks just like the real thing! All we need is the string, the paper tab, and the little staple holding the string... but we'll get to that after we make our non-spill tea. To make the non-spillable tea, all we need is the Edible Glass Recipe found in the Edible Decoration Recipes section. 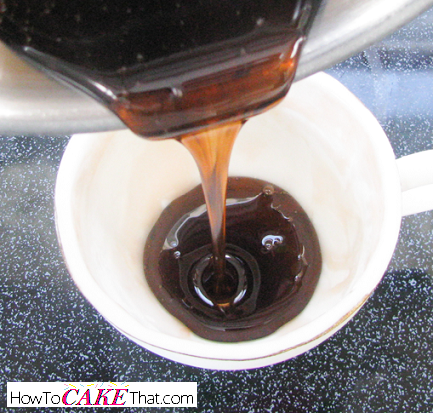 Once the edible glass mixture has reached the "hard crack stage", immediately remove it from the heat and quickly add a tiny amount of brown gel food coloring and stir to blend. I used just a tiny bit of Wilton's brown gel food coloring. Work quickly as sugar glass begins to set as soon as it is removed from heat. 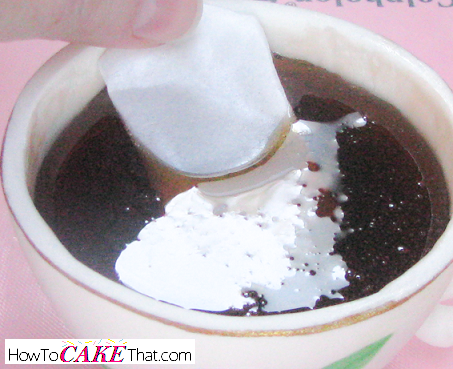 Pour the sugar glass mixture into your edible teacup. 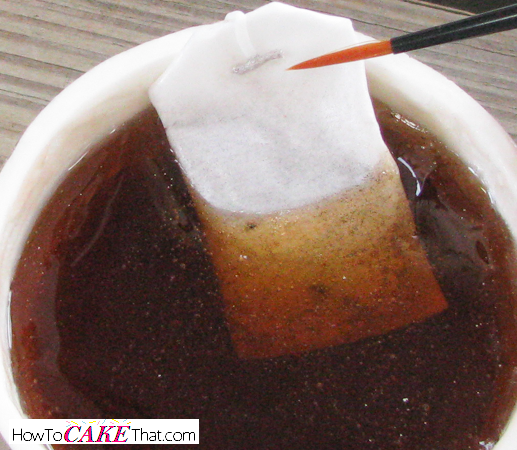 Quickly place your edible tea bag in the sugar glass mixture. Be careful not to touch the hot sugar - it will burn! 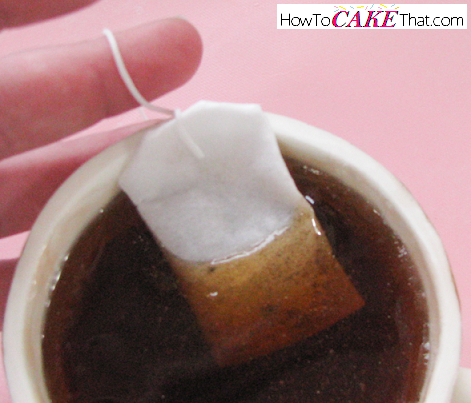 Use your thumb to hold the tea bag in place - it will try to float to the surface. Using a pin, quickly pop any bubbles that are near the surface. Once sugar glass has cooled, it's time to add the final touches! 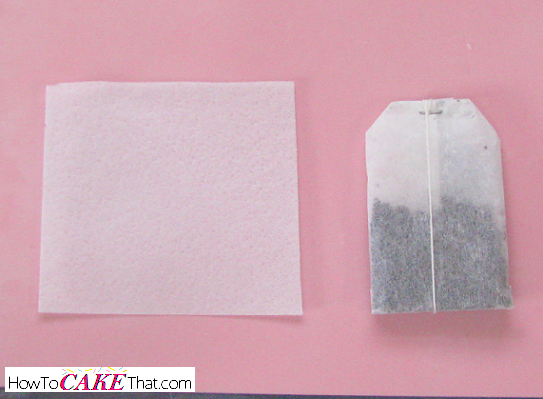 Make a thin string out of fondant to attach to the tea bag. To get a perfectly even string, I used a clay extruder fitted with the tiniest round disk. But rolling fondant out by hand will work as well. 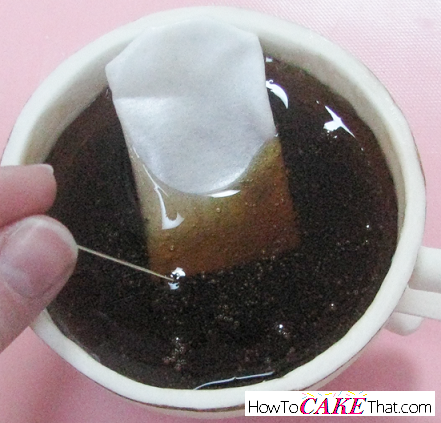 Then add a tiny bit of fondant to be the little staple holding the string onto the tea bag. 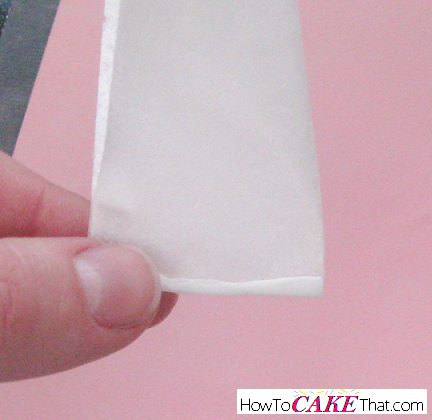 Adhere it to the fondant string by brushing a tiny bit of water onto the string. Next, use edible silver dust and a little alcohol (150 proof or higher) to paint the staple silver. Next, cut a small piece of wafer paper to use as the tab on the end of the string. Attach the paper tab to the string by brushing it with just a tiny bit of water. And that's how you make realistic unspillable sugar tea and edible tea bag for your edible teacup! I hope you have enjoyed this tutorial! God bless!! 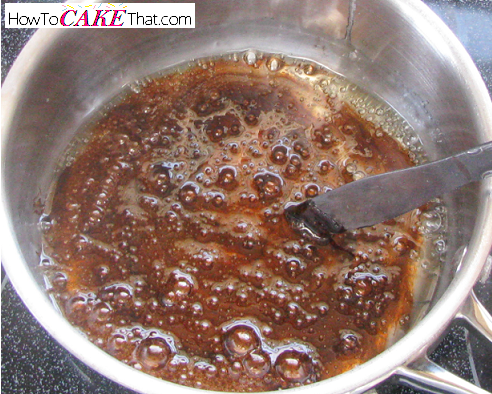 Note: The sugar tea will stay smooth and glossy for a few days if kept in a dry, cool climate. Just like any other sugary substance (like lollipops), it will get gummy over time and especially if it is exposed to humidity. Also, new bubbles may appear on the surface of the tea. A simple way to fix this and to give the tea a nice smooth surface again, just brush the surface of the tea with a thin layer of clear corn syrup (no need to color it). Allow the new layer to sit undisturbed for several days until it has dried completely.